Every year, we honor our alumni as well as our current students in a spring dinner celebration. Award winners return to campus for an honorary dinner and awards presentation led by Furman's president and the Alumni Board president. The Reid Award is named in honor of Wayne '68 and Rubye Reid and recognizes alumni who have made significant contributions to the career development of Furman students. The Outstanding Young Alumni Award recognizes alumni who have graduated within the past 15 years and who have expressed the finest of the Furman tradition through service to their profession and community. The Alumni Service Award is named for the late Gordon L. Blackwell '60, who served as president of the Alumni Association and was a member of the Board of Trustees. 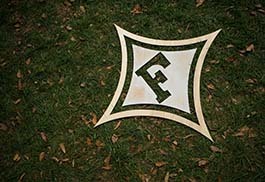 It is presented to alumni who have given loyal and dedicated service to Furman. The Distinguished Alumni Awards is presented annually in recognition of significant professional accomplishments and continuing loyalty to Furman. Nominate an alumnus for an award by sending an email to alumni@furman.edu and writing a brief narrative describing the individual's eligibility.